Some claim that the best Allied infantry divisions of the Second World War were the 4th and 5th Indian. Although the 2nd New Zealand also deserves to be considered, I think they have a point. The choice of the Indian divisions can be justified by length of service — both fought more or less continuously from late 1940 until the end of the war — and by the number of enemies engaged. The 4th Indian Division tackled the Italians, Germans and Communist Greeks. The 5th Indian Division did not meet the Communists, but instead engaged both the Vichy French and the Japanese. Interestingly, divisional histories suggest that the Italians and Vichy French were their most determined adversaries. They were at their most formidable in the early years of the war. A classic example is the Wavell offensive against the Italians in December 1940, when the 4th Indian, with the help of Matilda tanks, broke the main defences. Then the Indians were removed for more serious fighting in Ethiopia, leaving the inexperienced troops of the 6th Australian Division to mop up the remaining Italian forces. 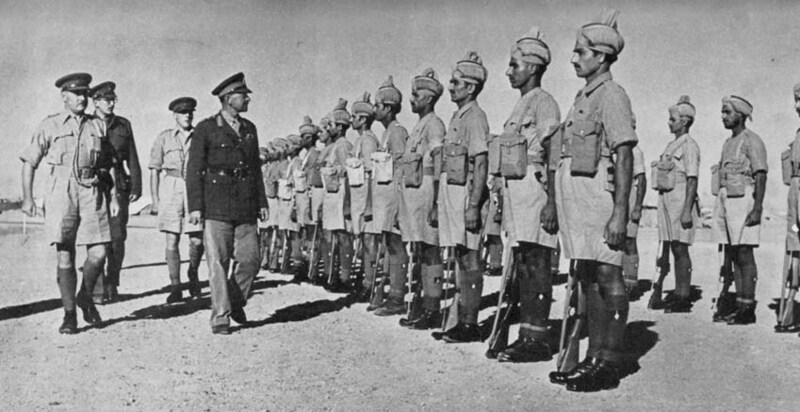 Gen. Harold Alexander inspects 3/2 Punjab Regiment. This is not surprising, as the two divisions had a higher concentration of experienced regular soldiers than any other. Most British (remember that they formed about half the fighting strength) and Indian units had recently fought, and defeated, the tribesmen of the North-West Frontier. Unlike some Indian battalions, which fell to pieces when facing the Japanese in late 1941, the 4th and 5th had not been diluted with new, virtually untrained recruits. Even so, until 1942 they did not contain a single Gurkha battalion! Today there is a temptation to think of the Gurkha units as being the best troops in an Indian division, probably because they remained in British service when India became independent. (It also helped that the best-selling author, John Masters, was a Gurkha battalion commander. If you want to get a true picture of the Indian army from the start till its end, you cannot do better than read any of his books, whether fiction or biography.) In truth, a Gurkha battalion could be better or worse than an Indian one — it all depended on training and leadership. 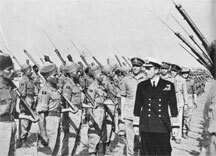 3/2 Punjab again, this time with Lord Louis Mountbatten. In the early years of the war, battalions were drawn from the Hindi and Muslim regiments of the Indian Army, units with titles like the Rajputana Rifles, the Mahratta Light Infantry and the Frontier Force Regiment. They all belonged to what the British called “the martial races,” almost all from the Punjab, the Frontier and Rajputana. In those times quality was defined in terms of racial characteristics, and the British preferred people who looked like what they thought a warrior should be — preferably tall and not too dark in skin colour. By 1942 the picture was changing. The original tough cadre of both Indian and British battalions was dwindling, due to casualties and removal to train new units. In the period covered by Desert Rats the Indian divisions had become less reliable. The “martial race” idea now began to be a problem. All Indian soldiers were volunteers, so by using only a small section of the Indian population, a shortage of good recruits soon became apparent. To make matters worse, there were not enough British officers that spoke the various native languages. In the long term both problems were solved, one by calling on new groups the other by promoting Indian officers. But in 1942 Indian divisions could no longer be considered the most reliable in the desert. Tobruk fell to Rommel in 1942 when three reformed Indian battalions, full of raw recruits, collapsed before the Afrika Korps attack. The kukri symbolizes Gurkha fighting spirit. Owners of Alamein will now understand why there are no complete Indian divisions present. Montgomery and Alexander (both generals from the British, not the Indian armies) had listened to stories that blamed recently-arrived Indian troops for the collapse at Gazala and after, and decided that they could not be trusted. When the victorious 8th Army reached the hills of Tunisia all this changed. Some staff officer finally remembered that most Indian troops were trained in mountain warfare. The scattered brigades of the 4th Indian Division were quickly dragged from garrison duty and brought to the front. By the time the Allies were fighting their way up the Apennine mountain range of Italy the lesson had been learnt, and among the most effective units were the elite all-Gurkha 43rd Indian Brigade — responsible for many of the hair-raising stories about their exploits with the kukri battle-knife; I always liked the tale about their habit of slitting the throat of all the sleeping Germans they found, except for one — and the 4th, 8th and 10th Indian Divisions.